← Poll Position: Is your secret safe? …and this tube of brylcream. Too bad there wasn’t any sunscreen, my inner thighs are fried! Stuck in the desert? That’s what you get for being in a romantic relationship with Bucky, pal. That Cap guy is overprotective. By E.T.’s glowing fingertip! He’s discovered Area 38!! 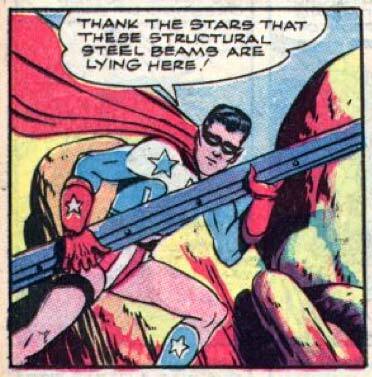 Structural steel beams, just lying around in the desert, huh? Don’t run through any tunnels, watch out for anvils, and whatever you do, don’t touch the birdseed. Bip Bip to you Bael. And once more, the day is saved by Our Hero . . . Uncanny Coincidence Man!